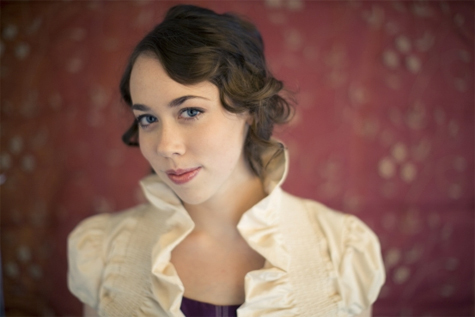 Sarah Jarosz, the artist that Word Magazine describes as a ‘wonder kid’, will release her sophomore album Follow Me Down through Sugar Hill Records. Sarah’s approach to acoustic music is expansive and vital; she sees no need to choose between old-timey and modern material; between picking, singing and writing; between experimenting and reviving tradition. She does all of it, and pushes it all further, on her new album. A lot has changed in the two years since the world outside the festival-going bluegrass and old-time music communities — home to many long time Jarosz fans — was introduced to the young singer/songwriter/instrumentalist. Her music caught on quickly with audiences across the age spectrum. There have been Grammy and Americana Music Award nominations, a trio of Austin Music Awards, invitations to perform on “Austin City Limits” and “A Prairie Home Companion” and appearances at Bonnaroo, Newport and Telluride — and lots of digital downloading, a rarity for a roots act. The most important difference is that Jarosz cannot be called a kid anymore. She’ll turn twenty within a week of Follow’s release. Instead of going straight to work as a full-time musician, as many before her have done, she left her hometown of Wimberley, TX — 30 miles outside of Austin — and headed to Boston’s New England Conservatory to study contemporary improvisation on an elite scholarship. “I wanted something to push me out of my comfort zone,” Jarosz says. “I wanted to be playing things that I might not normally play.” And she has had plenty of opportunities to do just that, from Jewish and world music ensembles at school to wildly unpredictable live jams with Punch Brothers and Mumford & Sons. That keen, open-minded attitude speaks volumes about her maturity. Like her first album, Jarosz co-produced Follow Me Down with Gary Paczosa (Alison Krauss, John Prine, Chris Thile). The grooves are more adventurous, for starters on the first single “Come Around”. She comments, “I know for some purists out there, it’s like, ‘Why do you have to have drums?’ For me, it’s like, ‘Why not?’” And she has explored alternative ways of using her already-strong voice (see her Radiohead cover The Tourist and Radiohead-inspired original My Muse; Bob Dylan’s folk hymn Ring Them Bells is the album’s other cover). There’s no missing the breadth in Jarosz’s songwriting. She is just as comfortable penning the tragic old-timey Annabelle Lee - an adaptation of Edgar Allan Poe’s final poem, or a modernized Appalachian ode to secret love like Run Away as she is cultivating contemporary singer-songwriter introspection in a song like Here Nor There. Follow Me Down is an album highly anticipated by many.